As our Central Texas Conference lay and clergy delegates work to prepare their hearts, minds and souls to serve as our representatives to General Conference in a few short weeks (April 24 – May 4), the other 166,000**-or-so members of the conference are asked to support them with prayers that the delegation(s) can enter into a true spirit of Holy Conferencing when discussing and debating the issues at hand and are able to focus on our mission of making disciples of Jesus Christ for the transformation of the world. But what are the real key issues that will move us forward and outward as we make our way through this wilderness journey? 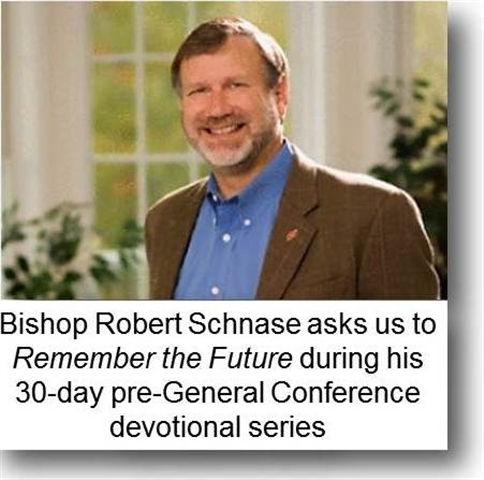 If that is a question that hits your heart, then make plans to join Robert Schnase for a series of reflections titled "Remember the Future: 30 Days of Preparation" as The United Methodist Church prepares for General Conference 2012. The purpose of Remember the Future is to deepen our understanding and further the conversations around the key issues that shape our mission and future as a denomination. These daily meditations explore hope, purpose, leadership and making/becoming disciples of Jesus Christ. With themes based in the Wesleyan tradition, proven leadership practices and, most importantly, Holy Scripture, our conference can join our brothers and sisters around the connection as we explore together the mission of the church in a time of great change. Joining is simple. Just go to ministrymatters.com/30Days and you will find an introduction to the series and an easy signup page. Beginning March 26, and continuing for the next 30 days as we march towards General Conference, Bishop Schnase will post a daily essay on the Ministry Matters site free of charge to e-mail subscribers. Each short essay will explore a key topic, scripture, and suggest ideas for deeper reading and exploration. Short video clips with also be posted each week in support of the key topics discussed. The following is a sampling of Bishop Schnase’s first reflection, which is already available on the Ministry Matters site. To read the full post and to sign up for the full series, visit ministrymatters.com/30Days. We’ll also have a link to these daily discussions in the featured section of the front page of ctcumc.org for those of you who would like to participate but don’t want another e-mail hitting your inbox. Watch for that link to appear a few days before the March 26 launch of Bishop Schnase’s series. Peter Steinke’s book A Door Set Open: Grounding Change in Mission and Hope contrasts hopefulness and hopelessness. Since reading Steinke’s book, the phrase Remember the Future has lingered in my mind. At first, the words are disorienting. Remember points backward, future looks forward. Yet in every discussion, deliberation, discernment, and decision, a leader must give deep and conscientious consideration to the future—to the future of the mission, to future contexts, to future generations, to a future with hope. General Conference 2012 promises to be a significant moment in the life of the United Methodist Church. Petitions, bishops, pastors, laity, caucuses, committees, boards, agencies, budgets, plenary, legislation, young people, the global church, conferences, ordination, mission, discipline, Wesley, malaria, seminaries, worship, translators, hymns, prayer—this is the peculiar vocabulary and singular language of General Conference. The agenda is overwhelming. The expectations are incredible. The worship is awe-inspiring. The array of material to read is unrealistic. The work is important. The tension is tangible. The outcomes are uncertain. And, I pray, the Spirit is present. I pray that delegates focus on the mission of making disciples of Jesus Christ for the transformation of the world. I hope they direct our energies outward into the mission fields at home and across the globe that God gives us. And I pray they remember the future. **number based on total membership numbers as reported at the end of 2010 in the 2011 Conference Journal.